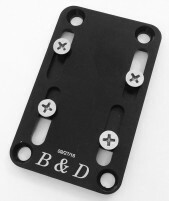 B&D is a precision machine shop in Redding, California that makes aftermarket ski touring parts. The owner is a backcountry skier who isn’t always happy with available equipment. He started making ski gear to improve his own experience and we all now benefit from well thought-out products. Cuff pivot points are a typical wear point on alpine touring ski boots. Constant motion around the pivots causes friction that can slowly erode the surrounding material. This eventually leads to some play around the pivots, which can make skiing less prec..
B&D is now making bolt-tension adjustment plates, in addition to their threaded-hole shift plates. This allows you to fine tune your heel pieces for different boot sole lengths. 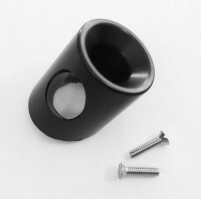 Interestingly, each fore & aft screw pair is connected underneath the..
Leave it to B&D to solve all your Dynafit mounting problems. The toe and heel shift plates can handle just about every drill hole and boot sole length configuration imaginable. 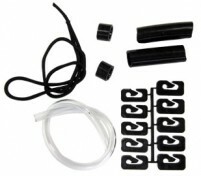 Mount a plate to your ski and then screw your Dynafit toe or heel onto the..
Getting the right ramp angle on your bindings can make the difference between skiing on-point or in the backseat with tired quads. 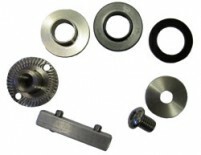 B&D makes shims for almost every occasion. Choose a shim based on your binding and desired pin height delta, which can t.. The backcountry ski touring leash from B&D is designed to alleviate the need to detach and attach your skis while putting on your climbing skins. The 1980s phone-style elastic cord stretches enough so you can lift your skis to put on your skins. This .. PLEASE NOTE: We have moved the shims to a separate listing: B&D Shims The engineering and machining wizards at B&D Precision in Redding, California also happen to be backcountry skiers. It's therefore not surprising that they dabble in making s..